And here it is! This is my 500th post and in perfect timing when we are all getting back to school or work after Labor Weekend. 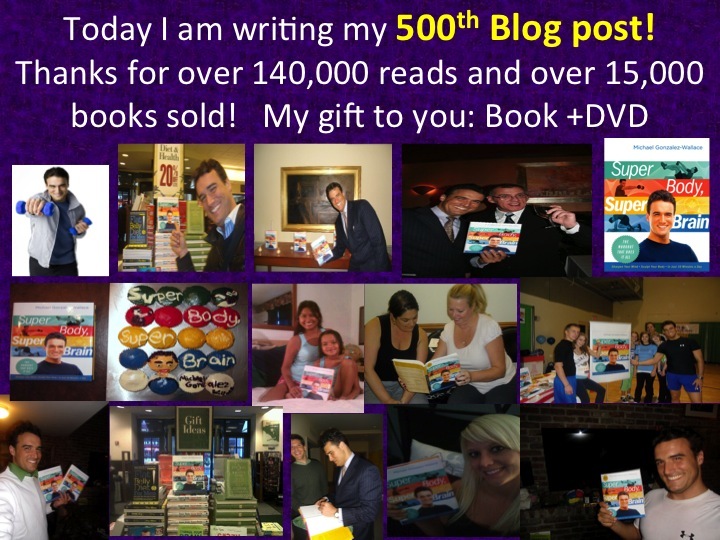 500 Posts ago I would never think I was going to be writing the 500th post and is not easy believe me and I love that you are reading my Blog! I can certainly guarantee that this has been the most fascinating journey in my life and I am proud that you have been with me all this way. You have been following me, reading me, sending me emails, asking me questions! I would never have thought that I would reach over 140,000 reads or hits in my Super Body, Super Brain blog or that I would ever sell over 15,000 copies of my book Super Body, Super Brain and have three formats: Hardcover, Paperback and Kindle and who would thought I would reach the Amazon Best Seller List in my first book! I wanted to send you free book and dvd for those 2 lucky winners! Send me an email at michael@superbodysuperbrain.com and write in the email subject: SUPER BODY, SUPER BRAIN WINNER and you will receive a Super Body, Super Brain Winner Package! Regarding my blog I wanted to share some statistics especially those posts that you have read the most. Click and share! This statistics are from the YEAR UPDATE wow!